As sales promotion is the motive behind the purchase of a number of our manufactured products, we have extended our range to include non-woven textile bags and natural cotton and jute bags. These items offering longer usage lives with high-perceived value at moderate cost can achieve ongoing impact for the promotional messages they carry. 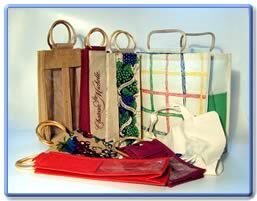 As our carrier bags and other film and paper message carrying products are described adequately elsewhere we have devoted this section to the items taking longer for delivery, but being nevertheless very worthy of consideration. We hope you agree. Please telephone us on +44 (0)20 7629 3246 to discuss your specific requirements and how we can help you.